A fascinating start to the St Leger Festival 2016. A Conditions Stakes (Plus 10) over 6f on good to soft going. 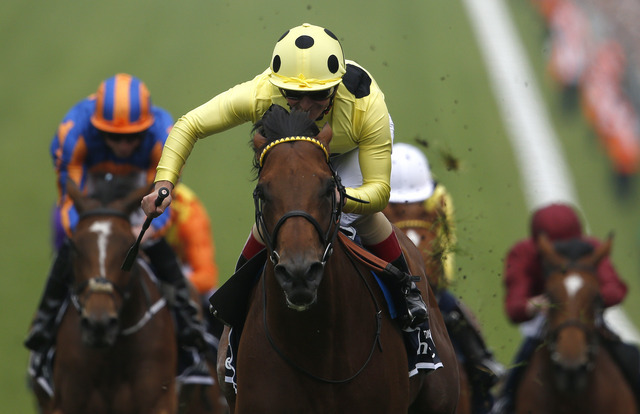 Dream Of Dreams sets the form being placed in the Railway Stakes Group 3 at the Curragh. Pulling up last time out when competing in the Gimcrack Stakes Group 2 is a puzzler, although connections must be satisfied that issue has been resolved. By all accounts, this is a significant drop in class. Battaash won well on debut when seemingly unfancied in the betting but disappointed next start when outclassed in the Windsor Castle Stakes Listed. Being second string to Owen Burrows' Akhlaaq suggests Hamdan Al Maktoum is pinning his hopes on this son of New Approach. This bay colt was purchased at the yearling sales for 4000,000G. We detailed this juvenile was held in high regard before his debut at Salisbury, where the money was down but winning looked unlikely until the dying strides. At the line, Akhlaaq won a shade cosily. The second has franked the form. Connections have pattern race ambitions with this sizable colt and they will be disappointed if he fails. James Bond fans will be backing *Ernststavrobofeld hoping trainer Martyn Mead has a devilish master plan. This chestnut son of Elusive Quality was a bargain buy at 62,000E. Racing in the familiar silks of Chelsea Thoroughbred - Diamonds, this colt is held in very high regard. He was a talking horse before making his debut at Great Yarmouth, which was a fair contest but nothing beyond the norm. This March foal took a good while to gather his stride and looked a touch outpaced before collaring the front-running Stanhope who used his experience gaining an easy lead. Mead is a calculated trainer - a perfectionist. He runs his juveniles selectively and places them well. Ernststavrobofeld was earmarked for the Gimcrack Stakes (Group 2) & most recently at Listed. Mead must have felt those races either come too soon or that to step straight into pattern class may have been a mistake at this stage. Improvement is needed from that debut. Jacquard and Town Charter represent Mark Johnston. The former has won twice and a fair juvenile. However, Town Charter is, in my opinion, the better horse. This grey colt is a son of Australian stallion Lonhro. He was put in his place on debut at Carlisle by a useful winner but cruised to an easy win next time out before finishing second to Mubtasim at Haydock. Make no mistake, William Haggas' winner is a class horse and that performance may have blurred the lines of this juvenile. On entries alone, he looks to be one of the better two-year-old in the stable. Although the Johnston duo has similar official ratings, I would be amazed if *Town Charter doesn't beat his stablemate. In fact, it wouldn't be a surprise to see him go well. Lost At Sea is the only debutante in the field. Karl Burke is a superb trainer and this son of Dutch Art is held in high regard by connections. However, it would take a mighty effort to win this race on debut. Conclusion: A fascinating race. It could quite easily be a Listed contest because the winner will be heading for pattern class sooner than later. Dream Of Dreams sets the standard but has to put that last start behind him. Akhlaaq & Ernststavrobofeld are both exciting prospects and although needing to improve they have a reputation and profile which suggest they will. Town Charter may be a dark horse. I feel that recent loss put this colt in the shade but time may tell it was a very hot contest. A difficult race to call. With only seven entrants the luxury of an each-way bet (3 places, at least) isn't an option. I would opt for Akhlaaq if pressed but, in truth, I will take a watching brief and enjoy this as a purist.